If you are looking to help with testing of this site, drop a note to musicsourcedirect@gmail.com and I’ll set you up with access. The ultimate goal is to make the site free to access and listen on-demand. However, there are certain copyright issues that need to be followed and therefore once the site goes live, there may be changes to this policy. It’s essential that the proper renumeration be made to the artists because without them, this site and their music would not be on here. To look at any of the FAQ’s here, just click on the question and the answer will appear. How do I join MSD? This site is currently in a Pre-Launch format, meaning that we are doing our final testing of formats and add-ins to ensure the best for our users. If you are looking to be a part of that testing, click Register from the Login section of the main screen. Once you send your registration, you will and e-mail with a confirmation link on it. Click the link and that will verify your username and e-mail as legitimate. 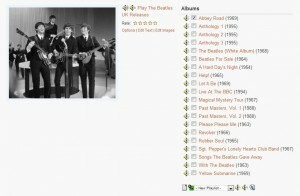 Can I download any music to my computer or device? Unfortunately the answer to that question is no. 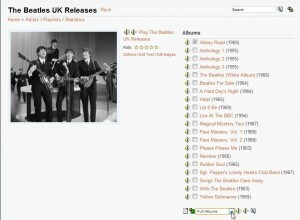 At this time, users are only able to listen to the music on the site. Why can’t I see any music or artists on the site? Listening to the music on the site requires you to be a registered member of MSD. Once you are registered, you will see a new menu option called Listen Now. At that point you can then choose from selections of the over 900 different artists and more than 20 different pre-built playlists depending on what you would like to listen to. How do I listen to the music on the site? Once you become a registered member of the site, you will have access to listen to over 1000 different artists and groups. Listening to the music on MSD is easy. Upon logging in, you will be directed to the main page that displays an alphabetical listing of the Artists and Groups. Using the menu options, you can scroll up and down the page and select the group of your choice. After the section you will be presented with a listing of the release from the artist that we currently have in the MSD library. Clicking the release you want to hear will then produce the track listing for the release with the information about each track. At this point, you have the option of either clicking on the Play link which will start the playing of the whole release, or you can select an individual track and listen to just one song. There is a few Menu shortcuts that can accessed via the Listen Now Menu option. Scroll your mouse over that and you will see other pages that you can quickly access. Once you click either the Play or individual track, you will see a player open up and you should hear the music. If you are opening this on a PC, you should have no issues hearing the music. However, if you are using a MAC or an Apple product, music will not play because of the lack of support for Flash players in the Apple OS family. The beauty of the separate player is that you can start the music playing and it will continue to run while you are working in other windows. Since we are still in the final testing stages of the site, your feedback is welcomed. From the Listen Now Menu, there is an option called MSD User Testing Form. Use this form to share your findings and suggestions to make the site more enjoyable. How do I create a personal playlist? Creating a personal playlist is a simple process on MSD. To get a better look at the images, click on them to opening to view them in a bigger window. 1) Open up the artist page for the artist you are looking to add. Click in the box of the album you wish to add to your playlist as shown below. Once that is checked, you need to choose the playlist want to add this selection to. This is done by going to the area below the listed releases and there is a Drop Down box there as shown below. This will list any Playlists you currently have created under your log in. For this example, we will create a new Playlist. By default, the playlist that is listed, is called New Playlist. Once done, click on the green Add To button next to this drop down. 2) The following screen will open after you click Add. 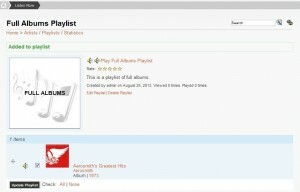 You can call your playlist anything you wish and add a description to better identify your playlist. Once you have added your information, click Submit. 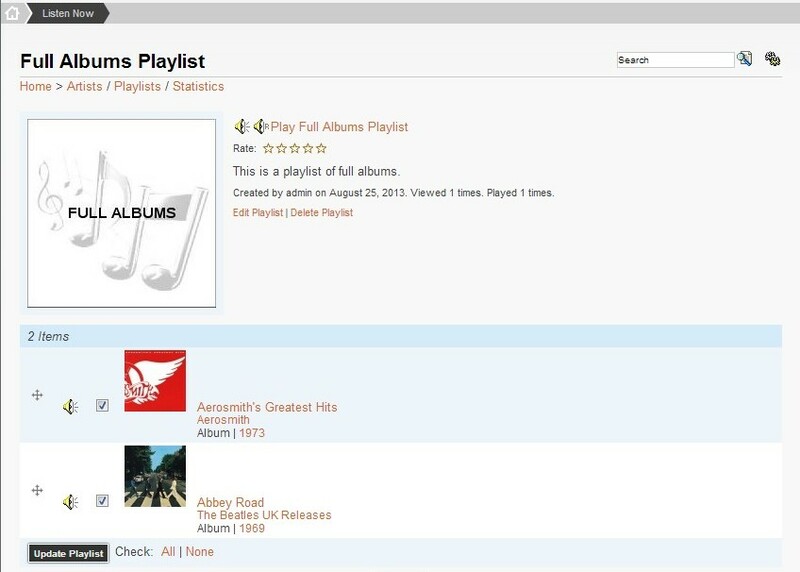 3) So now you have added your first selection to your playlist, it will now be displayed as shown in the example below. Playing this is as simple as any other ply command within MSD. You click the Playlist speaker or the Play commend on the screen. 4) Lets add another album and see how that looks and works. 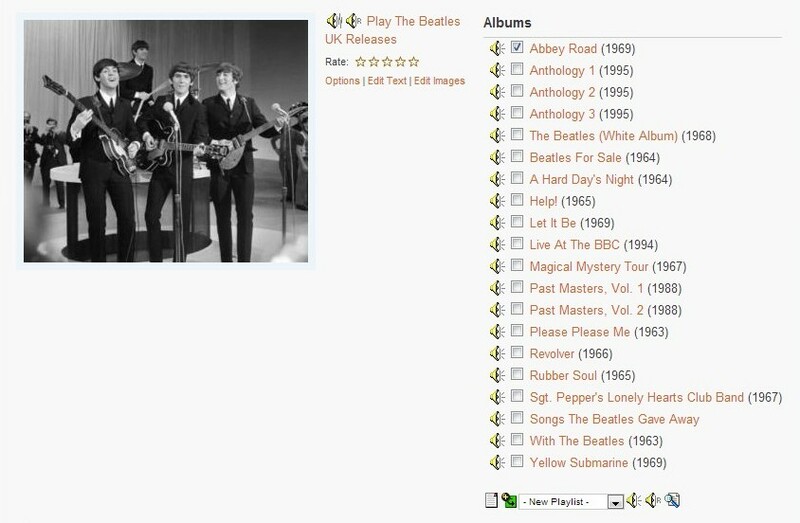 In this example I want to add the Beatles Abbey Road to my new playlist. As I had previously completed above, place a check mark in the box next to Abbey Road. 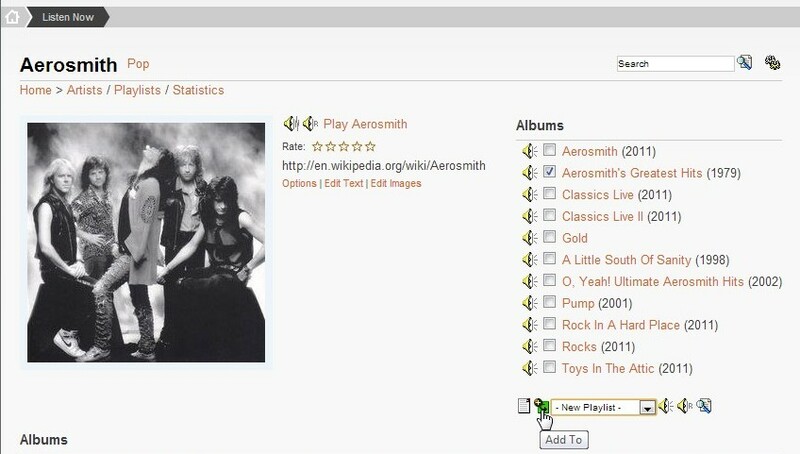 At the bottom of the page, click the drop down and choose your playlist. In this case, it was added to the Full Albums playlist. 5) After adding this playlist, you will see a message at the top of the page telling you it was added successfully. 6) To view your playlist, go to the Listen Now option on the main menu at the top of the page and choose Playlists from there. This will open up the list of any playlists you have created. In this case, choosing the Full Albums playlist will show you the screen like it is below. 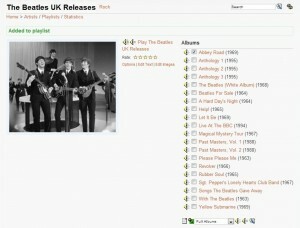 Clicking Play will start your Playlist with all of the songs from the releases you selected. Your Best Source Of Classic Rock and Pop from the Best Era Of Music. Rock N' Roll was born in the 50's. It got so big that it invaded in the early 60's. It grew long hair and became far out in the late 60's. The hair stayed long and the music evolved in the 70's. Disco came along and took us into the 80's with punks and new waves of sound. This is the music of our generation that has grown with us and it's all here for us to remember and enjoy once again. This current version of MSD is only available for PC's and will not work correctly on mobile devices at this time. We are currently testing some changes which will enable use on phones and tablets that don't use FLASH. Until that testing is completed, MSD is only available on PC's. © 2019 Music Source Direct.